Convergence takes place at venues across London between 10 – 2- March 2016. Actress, The Gaslamp Killer, !! 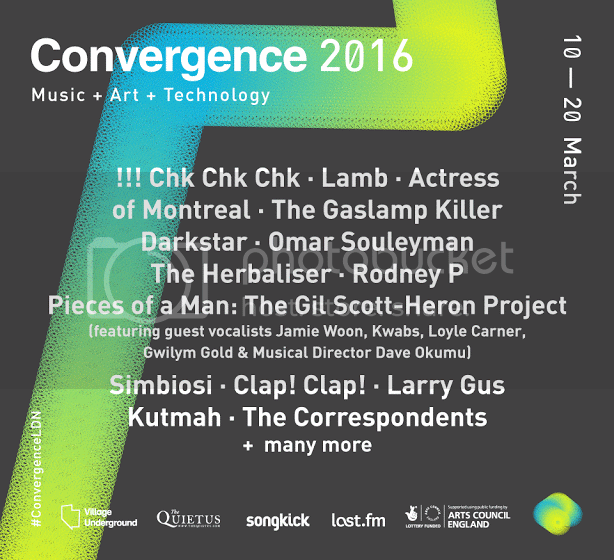 !, Omar Souleyman, Lamb and of Montreal are amongst the first wave of acts confirmed for the 2016 edition of London festival Convergence. Clap! Clap!, Simbiosi, Darkstar, Larry Gus, KUTMAH and The Herbaliser's Night of Future-Funk featuring Rodney P and The Correspondents are also amongst artists on the line-up for the third annual 'celebration of musical pioneers, visual artists and technologists', set to take place at venues across London between 10-20 March 2016. The festival's first in-house production entitled Pieces of a Man: The Gil Scott-Heron Project is set to feature guest vocal artists including Jamie Woon, Kwabs, Loyle Carner, Gwilym Gold and others under the musical direction of The Invisible's Dave Okumu, and will receive its premiere as part of the Convergence line-up. The project, which aims to recast Gil Scott-Heron's music in contemporary soul, funk and hip hop is, produced in association with Roundhouse and XL Recordings, and will end a day of talks, screenings and performances at the Roundhouse on Sunday 13 March 2016. Both the Roundhouse and KOKO have been added to the list of festival locations for the third year, which has previously included London's Barbican, Royal Festival Hall, St John-at-Hackney Church, Troxy and Village Underground venues. Convergence director and Village Underground artistic director Glenn Max is quoted in the festival media release as saying, ""While there is no single theme to this year's array of installations, talks, and concerts, a recurring idea is the re-materialisation of culture beyond its digital vaporisation. Technology wants us to be clean, carefully quantised and perfectly composed, but it is when artists break the rules that we are compelled and delighted." Max, former producer of the Southbank Centre's Ether and Meltdown Festivals, goes on to add, "We want our relationship with music and art to be messy, tangled and sprawling. Convergence is a many-headed beast led by heroic innovators, fiery personalities and evocative voices that are masters, rather than slaves, to the algorithm." With support from Arts Council England in 2015, Convergence hosted 30+ artists and 14 shows over ten days, across five venues. Festival highlights included Pantha Du Prince, Kiasmos, Andy Stott, Matthew Herbert, George Clinton, Gary Numan and Tricky. Convergence Sessions - a programme of talks and workshops around art and technology - will return in 2016 in partnership with Barbican Guildhall Young Art's Academy, Three Beards and Mixcloud, in addition to new partners, Cyland, Goldsmiths and Makerversity. Convergence takes place at venues across London between 10 - 20 March 2016.